I'm always so thrilled when a new Hitwoman book comes out and The Hitwoman and the Family Jewels was no exception. The downside is that I read them too quickly. 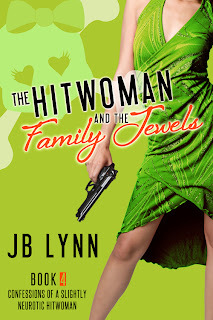 If you are going on vacation this weekend and need a light, quick read to keep you entertained, then you MUST get The Hitwoman and the Family Jewels by J. B. Lynn. In The Hitwoman and the Family Jewels, Lynn ties up some lose ends left from the first book. As the title implies, the story focus on Maggie's family particularly her incarcerated father. Her dad has broken out of prison, and more than just the police are looking for him. The positive side - her murder mentor Patrick has a legitimate excuse to stay close by. 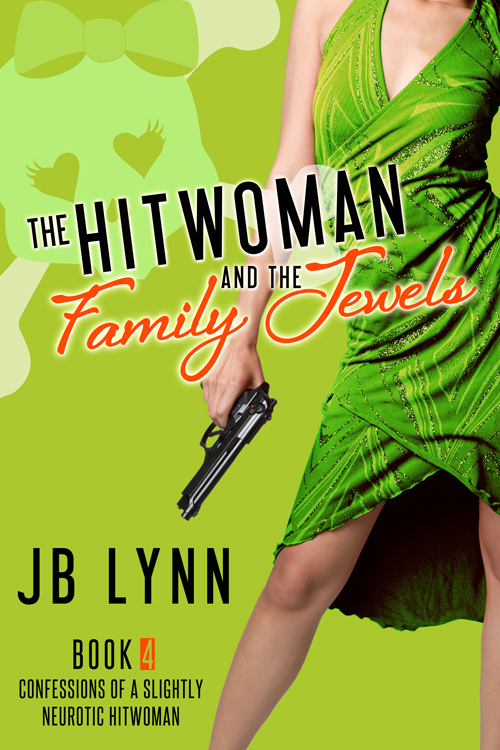 With The Hitwoman Gets Lucky, Lynn steered the series more into the chick-lit arena and the Family Jewels continues along that path. The bad thing about Patrick being constantly present - I think he's on to her new gift. And speaking of Maggie's gift, there's a new character. I foresee some great verbal sparing between God and this new character. Though his whining about no carnivores in the house troubled me since Dee Dee is a carnivore, but it is a minor point and really is more about the melodramatic theatrics that God is so good at. I'm friends with JB so I say this in a completely loving manner - J.B. Lynn is EVIL. To introduce the new character she almost mortally wounded my favorite character. But I have to say it's a testimony to Lynn's comedic writing skills that she can take serious scene and infuse it with humor. Though I was upset about what happened, it's the ending that made me realize the extent of the evilness. Just so you know, don't stop at the last page. Lynn found a little redemption a few clicks later. I've rambled through this review, because all the words I would use like hilarious, funniest series I've ever read, a must read... I've said all before. Really all I have left to say is WHY ARE YOU STILL READING THIS BLOG?! GET THE HITWOMAN AND THE FAMILY JEWELS NOW! Girl Who Reads is an Amazon advertising affiliate; a small fee is earned when purchases are made at Amazon through the link above. A free book was obtained from the source mentioned in order to provide an honest review. I've been practicing my EVIL laugh! ;-) Thanks for the kind review!